Salt water pool maintenance is actually quite simple with the technology available in todays chlorine generators and testing equipment. You'll spend less money and time monitoring the chemistry of your pool and spend a lot more time enjoying all the benefits. You should never have to purchase, transport or add harsh chlorine to the water and since salt water is a lot more stable by nature, it will require less chemicals than a regular pool. At the start of the season it's important to ensure that you get your salt water pool started on the right track. 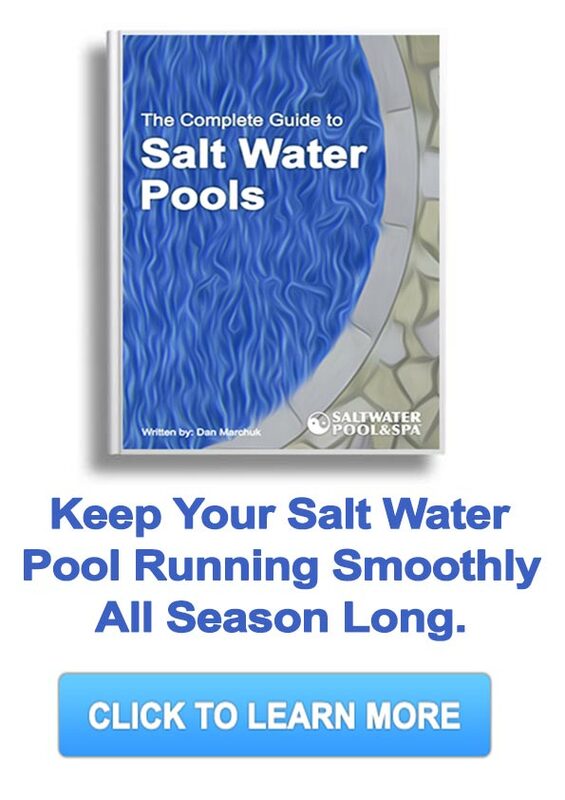 If you are just getting it up and running for the season we have an excellent step by step guide that will help you with opening your salt water pool in the spring. As the pool season progresses there will be some simple weekly and monthly maintenance that can be done by a handy pool owner. It's important to always follow the manufacturers instructions for your specific chlorine generator cell because the requirements can vary slightly. We've put together a salt water pool maintenance checklist specifically for salt water pool owners. As you continue reading keep in mind that not all pools, generators and water quality are the same which will present unique maintenance challenges. We've also put together a detailed hot tub maintenance checklist with helpful tips and advice specifically for salt water hot tubs. Your weekly salt water pool maintenance routine will depend on pool usage and environmental factors. In addition to spot cleaning with a skimmer net, vacuuming and emptying the pool pump basket the most common thing you'll need to do is balance the water chemistry. A pool app designed for use on a smartphone is a great companion for pool owner's that want to keep their pool chemistry in check all season long. The free available chlorine levels should be monitored and tested weekly and more frequently if your pH or alkalinity have been fluctuating. 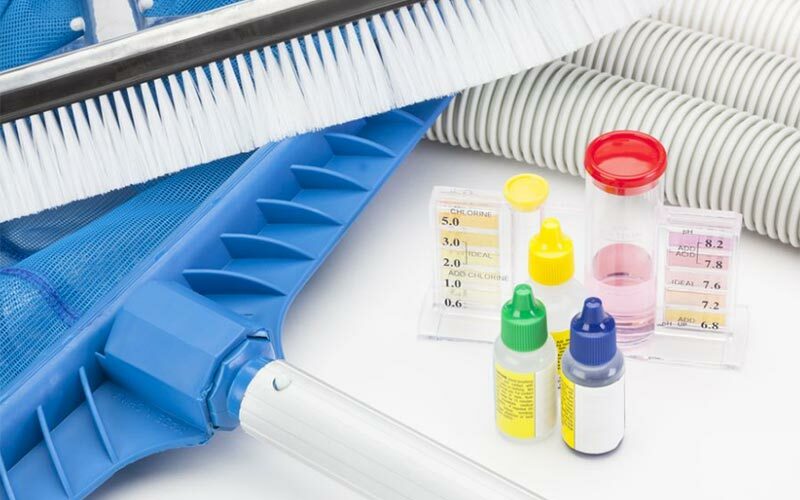 The combined chlorine and total chlorine can be ignored for purposes of testing and balancing, a quality pool test kit should be used that specifically measures free chlorine. If your free available chlorine levels are low, ensure your salt levels are sufficient so your generator can convert adequate amounts of chlorine. Low levels of free chlorine can also be caused by calcium build up on the salt cell, an expired cell or inadequate pool circulation. At the start of the pool season or after heavy pool usage it might also be necessary to shock your pool. The temporary boost of chlorine that a shock provides will allow the generator to start doing its job and should only be necessary occasionally throughout the pool season. Raise Free Chlorine by increasing chlorine production, pump run-times, super chlorinate or using a pool shock. The stabilizer level is very important to the over salt water pool maintenance, and is often overlooked by owners and professionals. A proper cyanuric acid level will prevent chlorine from being lost due to the sun's UV rays. An outdoor pool without stabilizer could lose up to 95% of it's produced chlorine on a sunny day leaving your pool unsanitary and potentially unsafe to swim in. A salt water pool requires slightly higher levels of stabilizer than a regular pool and should be kept in the range of 70 - 80 ppm. If you have an indoor salt water pool that doesn't get a lot of sunlight you can keep levels in the 5 - 30 ppm range. Stabilizer and chlorine work interchangeably and when one rises, the other should also. Raise Stabilizer levels by adding cyanuric acid and following the manufacturers instructions. A proper pH is important for allowing chlorine to effectively remove germs, bacteria and create a safe swimming environment. You may find that your pH rises slowly over time and if that is the case you will need to add an acid occasionally. It's important to add the acid or alkali slowly and in small increments, allowing the water to circulate for at least 4 - 6 hours before testing and repeating if necessary. A smart water care monitor can take your salt water pool chemistry management to the next level. It will monitor and notify if pH levels fall out of recommended ranges and some devices will even dispense acid automatically. Lower pH with a liquid hydrochloric acid or muriatic acid. If you use a dry acid under the name sodium acid sulphate or sodium bisulphate you may end up experiencing chemistry issues over time. Raise pH with an alkali calcium carbonate or soda ash. You might be interested in our pool maintenance cost page that provides some estimates for how much you can expect to spend monthly and yearly depending on whether you maintain your pool yourself or hire a professional pool service. The electrolytic cell operates most efficiently when the salinity is within the range specified by the manufacturer. The range can vary slightly with different models so it's important to know what your specific cell requires. If your cell and control panel does not have a built in salinity monitor or display we recommend testing weekly with a test kit that includes a salinity test or a digital salt meter. If your salt levels are low you will need to add salt, making sure that you never add too much because the only way to lower the salinity is to add fresh water. Learn more about adding salt to your pool, pool salt specifications and more salt water pool maintenance advice. In extreme cases you can cause damage to the salt cell and other pool hardware if the salt concentration is higher or lower than the recommended range. It could also lead to an unsanitary swimming environment if levels are low because there won't be enough chlorine produced which can also lead to pool algae. Alkalinity is important for keeping pH stabilized and preventing it from fluctuating. If you have low alkalinity it could lead to corrosion, staining or green water while high alkalinity can cause cloudy pool water and other problems. When adjusting alkalinity it's important to do it slowly and in small increments, waiting 2 - 3 days before testing and adjusting again if necessary. Lower Total Alkalinity with sodium bisulphate and following the manufacturers instructions. If your pH is also low you may also want to consider using muriatic acid. Raise Total Alkalinity with sodium bicarbonate in a slow and methodical process to ensure you don't raise levels too high. We recommend contacting a pool professional if your levels are above 400 ppm because this could lead to build up and stains that are very difficult to remove. If you want more information on how to clean stains from pool tile be sure to read our pool tile cleaner page. Lower Calcium levels is very difficult and is remedied by draining water from your pool and replacing it with fresh clean water. Raise Calcium levels easily by adding calcium chloride to your pool slowly and retesting every few hours to allow it to dissolve completely. The total dissolved solids, TDS for a salt water pool will be higher than a regular pool because salt registers as a dissolved solid. This means that your TDS should be exactly the same as your salinity in a pool that has no dissolved solids. If your TDS reading is 1500 ppm or higher than your salinity you may need to clean your filters or backwash more often as part of your routine salt water pool maintenance. A TDS of over 1500 ppm, excluding salt can reduce the effectiveness of the chlorine and other added chemicals, resulting in cloudy water or other issues. These levels are influenced by chemicals that have been added and organic compounds from anyone that uses your pool. In pools with extremely high TDS readings you will have to drain some pool water and replace with fresh water. It's also an important part of your overall salt water pool maintenance to test for Metals such as copper, iron and manganese to ensure they aren't present. The best time to test for metals is when you add fresh water or at the beginning of the pool season. A great way to check the overall chemistry in your salt water pool is to calculate the Langelier Saturation Index. This formula uses the alkalinity, calcium hardness, cyanuric acid, water temperature and pH of your water to help ensure that your pool isn't susceptible to scaling or corrosion. If you have kept on top of your weekly and monthly salt water pool maintenance you should only need to do a few checks at the end or start of the pool season. As you learn the behaviour of your pool it will be become clear what needs to be checked more often and what you can do less often. The salt cell should be inspected every 2 - 3 months to ensure that the plates are free of calcium buildup that can decrease cell performance. If you want to clean the cell yourself be sure to read our salt water pool cell page with helpful tips for cleaning your cell in as little as 10 minutes. The average life span of a cell is roughly 4 - 6 years and can be increased with routine cleaning and proper chemistry maintenance. A lot of salt water pool owners decide to use a zinc anode as part of their pool system. A sacrificial anode is an affordable device you can purchase for added protection against possible corrosion and damage to pool hardware. It's a good idea to check it once a year to ensure it hasn't degraded fully. At the end of the season a thorough pool closing is an essential step in your overall salt water pool maintenance. A closing kit will treat your pool water, making it a lot easier to open and balance in the springtime especially if you experience temperatures below freezing in the US or Canada.